Beat The Heat! - Elevation 9000 ft.
New Mexico is a one-license plate state, so many of the locals and other New Mexicans who have a cabin, or visit Cloudcroft in the summer, have a yellow license plate with red letters ELEV 9000 on their front bumper. Pretty neat. Cloudcroft, and area, is surrounded by over 1,000,000 acres of the USDA-Lincoln National Forest. 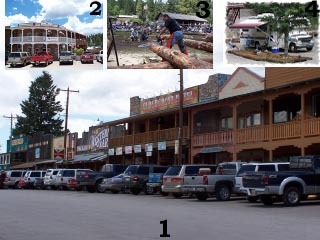 Cloudcroft, alone, has several NF-CGs within a 1-8 mile radius: e.g. - Apache, Deerhead, Fir (groups only across highway from Pines), Pines (our favorite-1 mile walk on OSHA Trail to "C"), Saddle, Silver and Sleepy Grass. The typical charge with a Golden Age Passport is $8.50/night w/14 day limit. A dump ($5) is available and water, too (n/c). The Sr Center ($2.50 lunch-- w/soup, entree, veggies, roll/bread, 1-milk, dessert, and unlimited tea) has a book-exchange library (300-500 contemporary paper backs). Cloudcroft library probably has a 3000+ book exchange (w/some current magazines). Plus Sr Cen & Lib offer free computer usage (e.g. -- share if others are waiting). USPS "honors" general delivery during short stays and/or summers. Jamoca Bean (hmm--Panini sandwiches w with Portobello mushrooms, goat cheese, greens), Rebecca's Fine Dining (Cloudcroft Lodge-Resort), Texas BBQ and other places with hamburgers, Mexican food, a bakery w/fresh scones-Danishes-jalapeno cheese bread, etc. In 2010 there will be multiple performances of these Melodramas: Happy Hollandaise, Blazing Guns at Roaring Gulch and The Boarding House. Plus there is a Renaissance Faire, juried Art Shows, July-HamFest, Arts & Crafts, High Rolls Cherry Festival, Weed 14th annual Bluegrass Festival, Labor Day Fiesta, Sep--(pic 3) Lumberjack Day (cash prizes and glory---free admittance). When we don't stay at the Lincoln NF-Pines CG, we stay at (pic 4) Sugar Pines RV Pk with FHU and about 1/2 mile walk on gravel roads to downtown /all 4 blocks of Cloudcroft. Otherwise, it's a mile drive on paved roads. In 2010 Sugar Pines is $20/N, $400/M or better long-term rates. It has free cable, free wireless internet, pull thrus, etc. Their facilities include a sundeck, laundry, bathrooms-showers, BBQ pit, etc. Ruidoso is less than 40 miles away with horse races all summer and the million+$$-Futurity Quarterhorse race Labor Day weekend. It has lakes, rivers, three Indian casinos- name entertainers, Spencer Theater, many antique shops, big-time winter skiing-----but Ruidoso is another story. Comments for Beat The Heat! - Elevation 9000 ft.
Cloudcroft is a great place to stay cool during the summer! The fishin isn't bad either. There are some good dry campin spots up North and East in the "Hila", but BLM land around Cloudcroft, Ruidoso and Lincoln are very senic as well! Keep in mind that with the mild winter climate there, its a great place to winter over too. Thanks Carol! I've been wondering if there is a place in the Southwest we could stay in the summer if we can't afford to go back north. Appreciate the information.